Hey everybody! 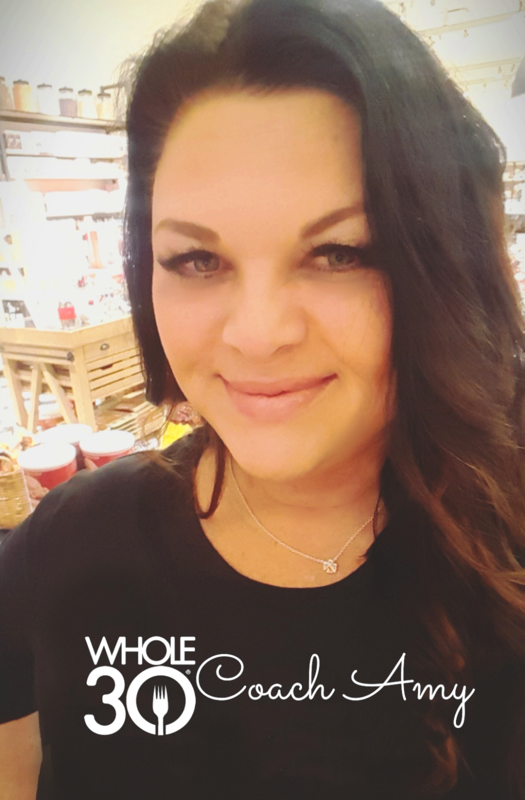 I shared this post with my friend and fellow Whole30 coach Judith over on her blog EverydayWhole a few days ago so I thought I would share it with you too! We are talking all about one of my favorite Whole30 comfort foods... nachos. Wait, what? Nachos can't be Whole30 compliant can they? Well yes, as a matter of fact they can, and I am here today to tell you how to make the magic happen in the kitchen. With the nachos that is, at least for this guest post anyway. But Amy.... I am on Whole30!!! I can't have nachos!!! FAKE NEWS. I don't know about you but nachos are with me for the long haul. However, since Whole30 has increasingly become a bigger part of my daily life I have realized they don't really make me feel all that great after I eat them. Don't get me wrong, the real deal nacho mountain with corn tortilla chips (or Siete at least) will likely always make an occasional appearance in My Food Freedom but for the most part now I make a wide variety of new and improved versions at home. And so can you! So, the coolest thing about making your own healthy nachos is that they can be anything at all. This is a fantastic way to use up leftovers which is 100% my jam cause... single Mom budget. All you need is a base, I like potatoes, some type of protein and a whole bunch of toppings. So let me just run thru the tried and true Whole30 compliant nacho making method I have come to count on in my hours of need. Take for example these Buffalo Ranch Chicken Chips I recently whipped up. The base is just thinly sliced (pre-baked and re-baked) oven baked potatoes brushed with a little fat of your choice. Cook those babies in a 450 degree oven though, so they actually become baked chips. 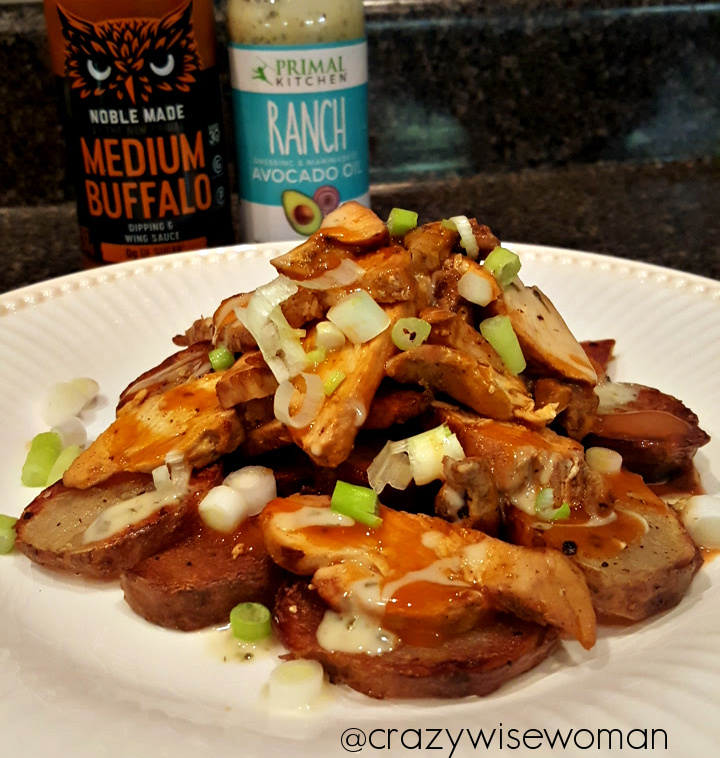 For this particular version I had leftover grilled chicken that I tossed with The New Primal Buffalo sauce then drizzled with more of that, Primal Kitchen Ranch Dressing and sliced green onions. One of my favorite Whole30 hacks is to bake a bunch of potatoes at the beginning of the week and store them in the fridge for other recipes later, like nachos (chips) and crispy breakfast potatoes for hash, etc. 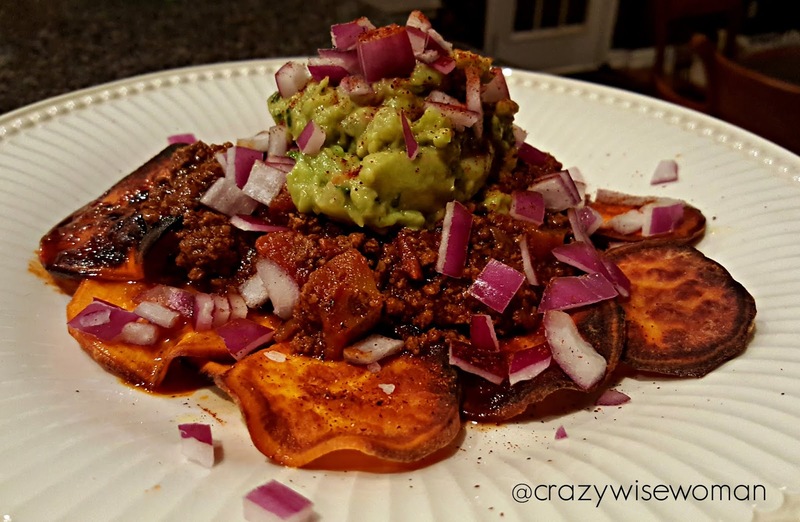 Another favorite variation of Whole30 compliant nachos is the Sweet Potato Chips and Chili version. This is more of a fall/winter go-to for me so pretty much perfect to start working into the rotation for September Whole30. Unlike white potatoes I find you have to start with thinly sliced raw sweet potatoes and either fry them quickly in the fat of your choice or brush with oil and bake in a very hot oven till brown and crispy. Then load them up. This plate is Mel Joulwan's Chocolate Chili topped with guac, red onion and taco seasoning and it is off the chain delish. I am also a big fan of loaded fries so they are getting an honorable mention here too. 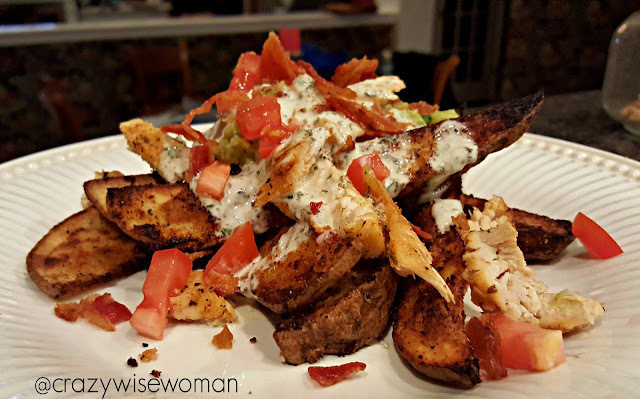 Potato wedges brushed with olive oil, salt and pepper and baked until crispy really just beg to be doused in ranch dressing, bacon bits, green onions and tomatoes don't they? Trust me, they do. So don't forget about this as an option either. Now, before you go getting all worried about me I am not eating Whole30 nachos and loaded fries every day, but once in awhile they really hit the spot. My kids love these types of recipes too and often they have no clue it's "that Whole30 stuff again", they just gobble it up. And for all of you who love to party and entertain like me, it is football season and the holidays are right around the corner. I promise, make any of these, or your own variation, in a sheet pan version and your guests will be very happy humans. I hope this made you drool or at least gave you a few good ideas on how to change up your Whole30 game just a little now and then! Good Luck on your September Whole30 if you are doing one and have a great weekend!!! Sweet potatoes gave me life during Whole 30 and hit that spot nothing else could. All of these options look so delicious! !